Whilst in Devon recently we paid a visit to Cotehele House, just over the border in Cornwall. This is a favourite place; granite walls set in an ancient landscape of trees covered in lichen and a terraced garden that looks over the Tamar valley to Calstock and beyond. The day was sunny after a frosty start and we took a stroll around the wintered grounds where the sounds of gushing water and the smell of wood smoke blended together as the low sun cast fingers of shadow. I ventured up the nearby Prospect Tower which was built in the 17th century but whose origins are obscure. After a dark, winding stair climb I emerged into the sun and some wonderful views. ‘Every November gardeners and volunteers… create a 60ft long Christmas garland using thousands of flowers grown on the estate. The giant swag … hangs in the Great Hall throughout the festive season. Preparations for the garland begin months earlier in February when the flower seeds are sown. The first flowers are ready for picking from late April and are then dried in the loft over the summer and autumn before the garland is put together over two weeks in November. ‘Each year the garland is different, depending on which of the specially grown flowers have done well,’ adds Dave. The garland often includes ornamental grasses, everlasting sand flower, straw flower, paper daisy, paper rose, statice and garden thrift. On our last Devon trip we spent a day at Antony House, Torpoint. This 18th century mansion tells the story of a family caught up in the English civil war, a place which is still home to the Carew- Poles. Before entering the house it was great to visit a small exhibition of some interesting artefacts, including one of Humphry Repton’s original ‘Red Books’, where he set out his assessment and vision of the gardens including some beautiful, if soemtimes fantastical, ‘before and after’ watercolour illustrations. ‘A house of silver grey stone, Antony is a beguiling mixture of the formal and informal. It’s believed to be one of the finest surviving Queen Anne buildings in the West Country. View the outstanding collection of portraits, including works by Sir Joshua Reynolds and a famous painting of Charles I during his trial. There are also fine examples of period furniture, textiles and tapestries. Breathe in the sweeping views as you explore the landscape garden, which includes a formal garden with topiary, modern sculptures and the National Collection of Daylilies. The gardens and grounds are exceptional. The tree collection is especially interesting and I was pleased (and inspired) by their tree trail which gives few bits of information alongside each specimen – and there are plenty of these, many at or beyond maturity. The walks around the woodland garden are peaceful, with a selection of viewing and sitting points overlooking the nearby channel, and, when we visited, a superb collection of Rhododendrons and Azaleas in flower. I also loved the pond and some playful timber seats, which contrast with some very old wooden seats in the more formal garden spaces. As you may have read earlier this week, in my post about my latest session at Blickling, I’ve made progress in getting a similar tree trail project going there, so am very thankful for the detailed information Antony provided on how they put theirs together. Quite a contrast with the previous Cornish garden visit to Glendurgan, Trelissick (yes another ‘tre’) was all about late summer colour. A mixture of woodland planting and smaller borders and walled gardens full of herbaceous perennials (including some beautiful exotics), this is another wonderful coastal garden in the damp and mild south west, between Falmouth and Truro. This ‘Technicolour’ treat was a wonderful last garden visit on our summer trip to Cornwall, though we managed one more garden (Devonian this time) before heading back home. 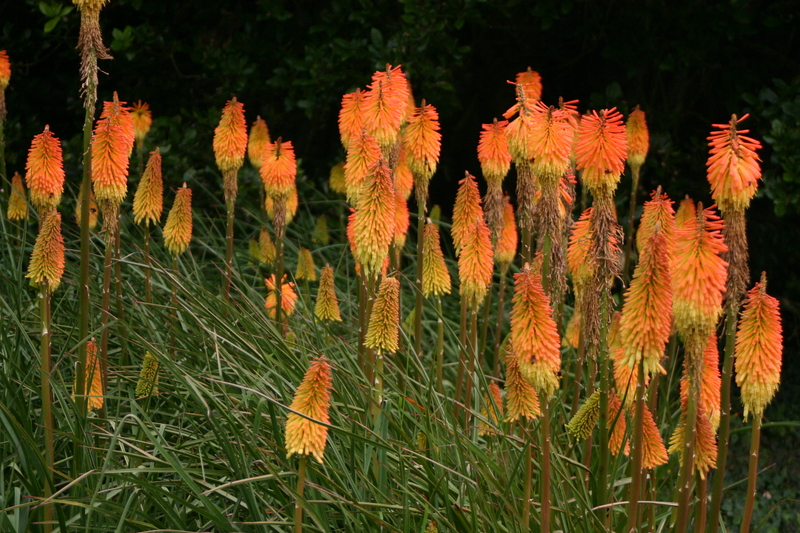 Here are some close-ups of the variety of blooms on show when we visited Trelissick towards the end of August. I was most impressed with the overflowing border nestling towards the bottom of the grass – lined valley close to the entrance. A billowing display of colourful masses of flowers and foliage, the Cotinus coggygria (I think it might have been the variety ‘Grace’) looking especially vivid as a low sun caught its large leaves of reds – purples. Here is a gallery to show you what I mean. The Fal valley with smaller creeks and inlets branching off on either side is reached via wooded slopes with oaks and beeches overhanging the mudflats of the tidal creeks. The King Harry Ferry below Trelissick is the only connection across the water to the Roseland peninsular on the other side of the estuary. In about 1750 a modest two-storey villa was built at Trelissick on the foundations of an earlier building. This house was remodelled in 1825 by Peter Frederick Robinson who added the columned portico which rises to the height of the south front. Robinson’s patron was Thomas Daniell whose father had bought the estate in 1800 with the fortune he inherited from tin-mining interests. Thomas Daniell planted much of the woodland along the shores of the estuary and the carriage drives he laid out in the park are now shady woodland walks. Between 1844 and 1913 the estate was owned by the Gilbert family who made great improvements to the grounds. They planted ornamental woodlands and some of the huge holm oaks and conifers in the garden. The wonderful garden seen today was largely created by Mr and Mrs Ronald Copeland after Mrs Copeland inherited Trelissick in 1937. This has been in the ownership of the National Trust since 1955 when it was donated by Ida Copeland following the death of her son Geoffrey. Many of the species that flourish in the mild Cornish air, including the rhododendrons and azaleas (such a feature of the garden, but not in bloom when we visited), were planted by the Copelands including hydrangeas and camellias, flowering cherries, and exotics such as the Ginkgo and various species of palm. They also ensured that the blossoms they nurtured had a wider, if unknowing audience. Ronald Copeland was chairman and later managing director of his family’s business, the Spode china factory, and flowers grown at Trelissick were used as models for those painted on the pottery produced at the works. The garden is noted for its rare shrubs (it holds the national collections of Photinias and Azaras) and features a large park, woodland walks, views over the Fal estuary and Falmouth – there are ‘peep hole’ glimpses of water punching through the sloping woodland canopy that surrounds the extensive park path system. After a pleasant afternoon break in the courtyard restaurant (though we were joined by some cream tea loving wasps) we took a leisurely drive onward to re-enter Devon on our way back to East Anglia. Here are some images of this wider, parkland setting, which,along with the rest of the place, is kept in tip-top condition, a credit to the garden team. Very much a garden for the plant enthusiast, I think, particularly if you’re into sub tropical ferns and sun loving agaves. When we visited in mid August the three valleys that make up this garden were bathed in warm sunshine and there was the sound of children’s laughter from the Maze and play spots. The valleys tip out into the Helford river where the hamlet of Durgan (now a series of holiday lets run by the National Trust), looks across the wide, slow running estuary that leads to Falmouth a little further up stream. There’s also much of interest here for those that love inspiring landscapes, featuring variations in foliage shape, size and tint coupled with the different masses and forms of the many exotic trees and shrubs. 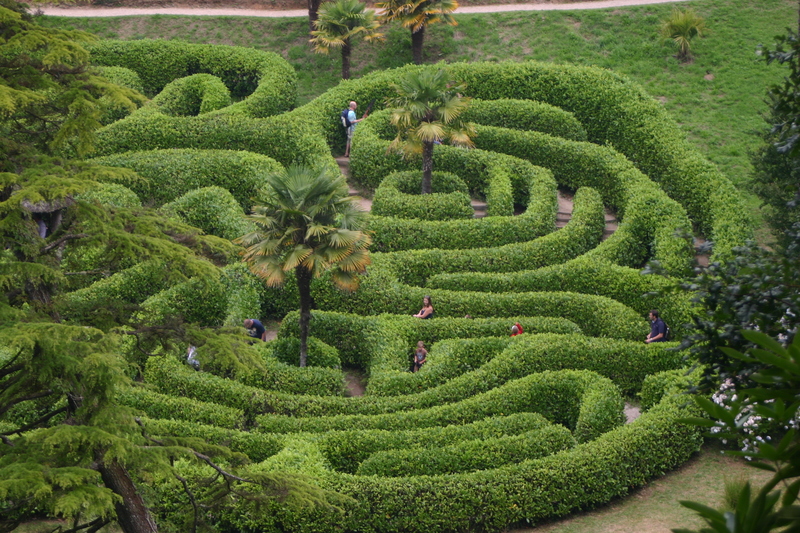 This is a well crafted garden that makes the most of its situation, with breathtaking valley-side paths that give glimpses of interesting trees, features and of course that maze. Despite being busy when we visited, the garden’s enclosed volume seemed to capture sound and, rather like a cathedral, gave back softened echoes that settle the soul. My previous article on Trengwainton covered the wider gardens and grounds as well as some historical background. 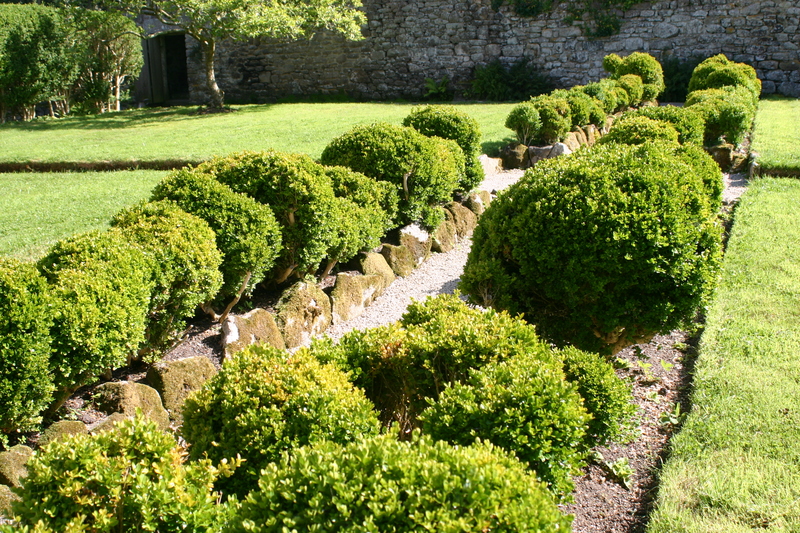 Today I want to focus on the extensive walled gardens, built by previous owner, Rose Price. This is said to follow the dimensions of Noah’s Ark- though why, I’m not sure. It also seems to have been created as a response to the period of persistently cooler weather known as the ‘Maunder Minimum’ (or otherwise known as the ‘prolonged sunspot minimum’). This period- starting in about 1645 and continuing to about 1715 – was when sunspots became exceedingly rare. The term was named after the 19th Century solar astronomer Edward D. Maunder who studied how sunspot latitudes changed with time. The Maunder Minimum coincided with the middle—and coldest part—of the ‘Little Ice Age’, during which Europe and North America were subjected to bitterly cold winters. recent research has established a causal link between low sunspot activity and cold winters. The surrounding garden wall prevented warm air from escaping from the garden on cool nights, thereby allowing frost-sensitive fruit trees to survive, despite the cooling climate. The walled garden is also interesting for its use of sloping beds – orientated to take advantage of the sunny aspect and so aiding the warming of the soil and creating beneficial growing conditions. The gardens – there are separate walled enclosures rather than one large expanse – are both a fascinating horticultural legacy and also a modern-day guide to good food and flower growing. There are demonstration plots and little corners showing different sorts of container growing, raised beds, nectar – rich flowers, a DIY device for creating liquid plant food etc. A wide range of food is still grown here as well as beautiful ‘cottage garden’ style flower borders, orchards and a demonstration plot conjuring up the ‘Dig for Victory’ campaign of the second World War. And while we were there the Gardens sported a delightful display of home-made ‘fairytale’ characters which amused and enchanted the young children who were eager to discover the next character on their way round! Another one of the ‘Tre’s’ or ‘place’ in Cornish. Trengwainton was one of those west country gardens I visited during my summer holiday in West Cornwall and Devon. The estate and gardens are huge and richly varied, so I’ll devote this article and pictures to the wider estate and gardens along with some general background. 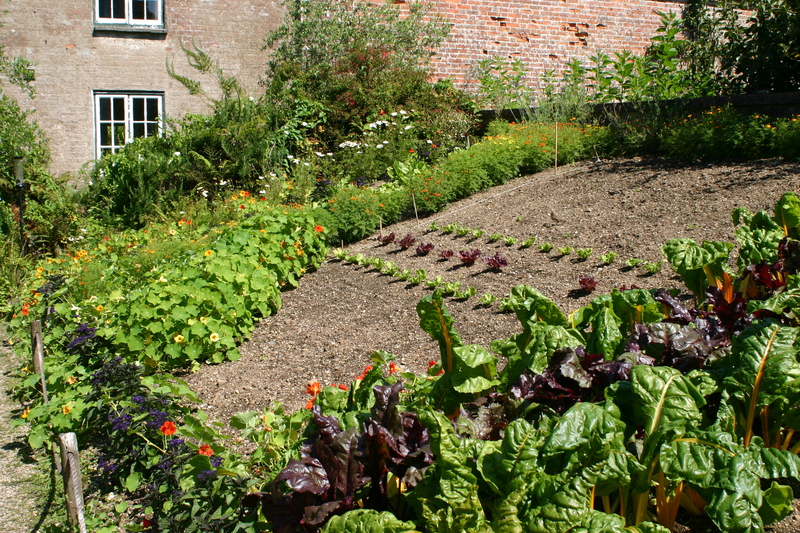 A following post will focus on the fascinating walled garden. Trengwainton, located in Madron, near Penzance, has been in the ownership of the National Trust since 1961. The garden is noted for its collection of exotic trees and shrubs as well as great views over Mount’s Bay and The Lizard peninsular. A house has stood here since at least the 16th century and was altered and extended in the 18th and 19th centuries (it’s now a listed building). In 1814 the estate was bought by Rose Price, the son of a Jamaican sugar plantation owner. Trengwainton was sold following the loss of income resulting from the 1833 Emancipation Act (which freed slaves on the family’s Worthy Estate in Jamaica). In 1867 the property was bought by T S Bolitho whose family still live in Trengwainton House. Rose Price planted trees and built the walled gardens and in 1925 Sir Edward Bolitho and his head gardener Alfred Creek continued the development of the gardens. They were opened to the public, for the first time, in 1931. The Victoria Medal of Honour for Horticulture was awarded by the Royal Horticultural Society to Sir Edward in 1961 and in the same year he donated 98 acres to the National Trust. The day of our visit was sunny and warm. The walk around the gardens was a delight. Exotic plantations (many created during the 1920’s craze for exotic, new plants), give way to a long, winding, uphill approach to the House, which is lined with meandering footpaths and dells with running water, masses of different hydrangeas in bloom, all under the dappled shade cast by many and varied trees. This opens out to a large lawn in front of the House and beyond this to a pretty elevated walk lined with Agapanthus and twin focal – point pavilions. This area affords spectacular views of the coastline – and is obviously also a good spot to learn kite flying! The estate is famous for its spring show of Camellias and Azaleas. The late summer show from the Hydrangeas, Agapanthus, Fuchsias, ferns and exotics, was very impressive – I must return in the spring to compare! As part of its campaign to get children to do ’50 things before you’re 11 3/4′ there was an invitation to create some ‘Wild Art’ (I couldn’t resist) as well as the kite flying and other adventures – a great idea. 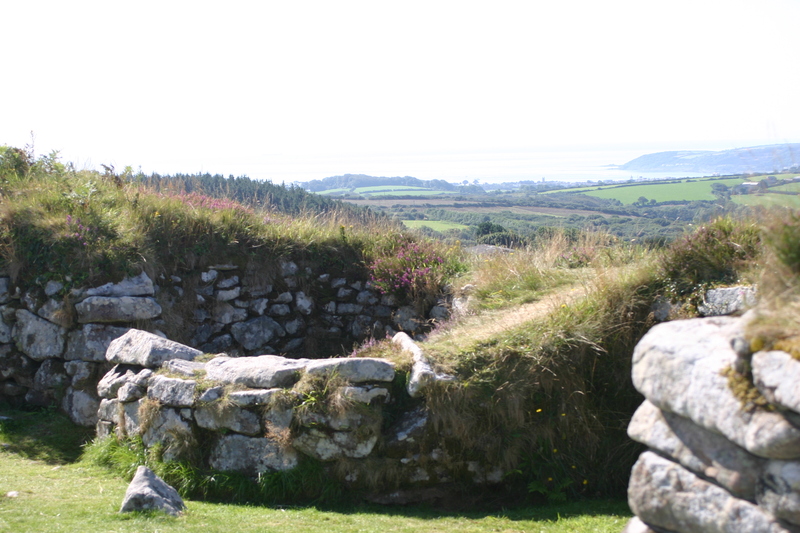 Whilst on our summer holidays in Cornwall and Devon, we visited a fascinating iron age village – Chysauster, near Penzance. Thought to be around 2,000 years old, this wind-swept, rocky network sits on a south-facing slope overlooking Mount’s Bay. It’s thought the location takes advantage of a natural spring on the hill slope, for to locate a settlement in such an exposed spot would other wise seem a little crazy. However, having got their supply of fresh water the occupants were able to create a microclimate within their thick stone encircling walls (The walls survive to heights of up to 3 metres). Channelled water to each house and it’s accompanying courtyard/garden and the tall, 4 metre-thick walls created a sheltered, sun soaked encampment – perhaps they even grew food inside these compounds? Primarily agricultural and unfortified, and probably occupied by members of the Dumnoii tribe, the village today has the remains of around 10 courtyard houses, each about 30 metres in diameter. Eight of these form two rows. The houses have a similar layout with an open central courtyard surrounded by a number of thatched rooms, orientated on an east-west axis, with the entrance facing east. A field system in the vicinity demonstrates the site’s farming connections. The whole site also has wonderful views of the surrounding landscape. Work is underway with local schools to create an ‘iron age garden’ where some of the old varieties of wheat (such as Spelt) and other plants will be grown. The Site Manager, Steve (whose accent I immediately recognised as East London!) , gave us a great potted guide to the place and he’s obviously enthusiastic for the site’s future development as a super educational as well as heritage ‘must see’ attraction. A rather lower key garden visit this one, but still very enjoyable. The Godolphin Estate is the former seat of the Dukes of Leeds and the Earls of Godolphin. It contains one of the most fashionable Tudor/Stuart mansions in Cornwall. The present house is remnant of a larger mansion. At one time it was a secondary seat of the Dukes of Leeds, but the Duke sold it in 1929. The Estate is a total of some 550 acres (220 ha). The early formal gardens (dating from around 1500) are said to be among the most important historic gardens in Europe, having barely changed over the years. These include some interesting formal walled gardens and further afield remnants of grassed areas, ponds and ancient trees, with the addition of some meadow areas. The atmosphere is one of quiet and restraint, typical of its age and predating some of the more exuberant formal and landscape gardens of the following centuries. It was very pleasant exploring the gardens on a sunny August afternoon, the peace and quiet, interrupted only by the sound of bees humming around a series of hives which are part of a study looking into the qualities of the Cornish bee, one of the oldest breeds around. In some areas the gardens and planting are in need of careful restoration and renovation, to bring out their full interest and attractiveness. This process is being pursued by the National Trust, which has also been improving public access to the Estate. since they acquired it in 2000. 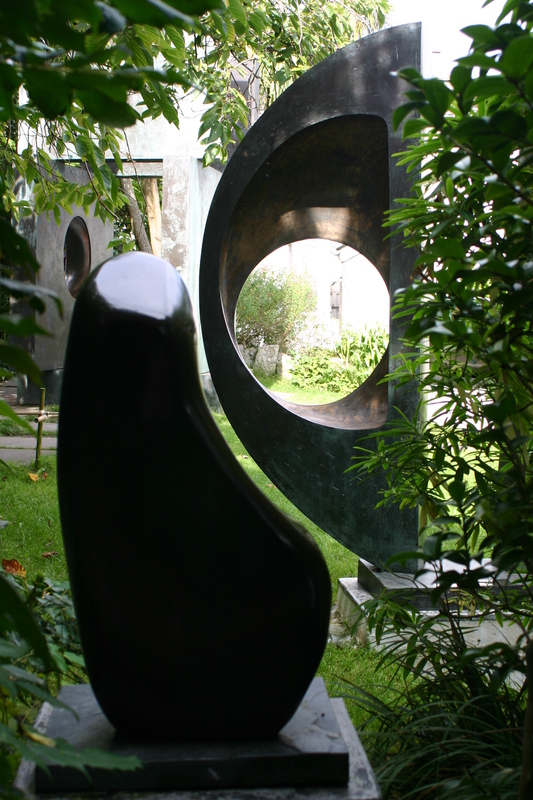 Whilst on holiday near St. Ives, Cornwall, recently I took the chance to visit the Tate Art Gallery – something of an ‘icon’ of the town – and the Barbara Hepworth Sculpture museum and garden. The Tate is an impressive building, but I found it a little disappointing, mainly because of it’s relatively small display areas. There are plans afoot to expand the place and that should help to further strengthen its impact. ‘Barbara Hepworth first came to live in Cornwall with her husband Ben Nicholson and their young family at the outbreak of war in 1939. She lived and worked in Trewyn studios – now the Barbara Hepworth Museum – from 1949 until her death in 1975. Following her wish to establish her home and studio as a museum of her work, Trewyn Studio and much of the artist’s work remaining there was given to the nation and placed in the care of the Tate Gallery in 1980. I particularly liked the way sculpture and planting are treated as complementary, the masses, textures and forms of the plants being used to echo or contrast with those of the sculpture and vice versa. There is also an amazing sense of space in this relatively small garden, achieved by the winding, gently rising and falling path which opens up views across the garden to the sculptures which, together with some impressive trees, bamboos and shrubs provide height which draws your eye away from the boundaries of the garden, themselves clothed in plants. A classic design trick for smaller gardens this – using features with height inside the space to draw the eye inwards, coupled with a masking of the boundaries to convey uncertainty about where the garden begins and ends. I hope that you enjoy the photo montage I snapped on a sunny day in August.